Discover the world-famous Tullamore Dew presented in its original crock. Produced by the Midleton distillery, Tullamore Dew is named after a distillery that closed in the 50s. Tullamore Dew is a blend with a high percentage of Pure Pot Still, made with malted and non malted barley. It has a unique taste with a triple-distillation typical of Irish whiskeys. Tullamore Dew is the number 2 Irish whiskeys in the world with more than 5 millions of litres each year and one of the booming sales in France. 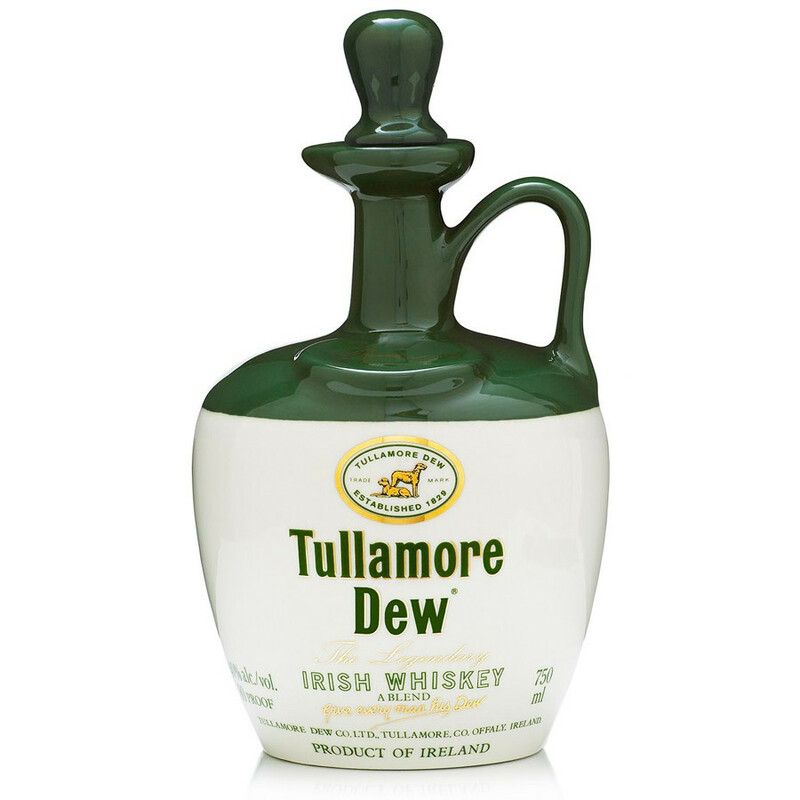 Tullamore Dew is today presented in its traditional ceramic jug with porcelain stopper, used in the brand early days back in the 1820s. Tullamore Dew has typically fruity (red berries) notes with spicy and sweet cereal aromas. The Tullamore distillery has been established in 1829, in the town of the same name, located between Dublin and Galway at the heart of Ireland. Its story goes back a long way, and the distillery took off under the management of Director Daniel E. Willams. He significantly forged the distillery’s development, where he started with turning the malt. As a true self-made man, he quickly climbed the ladder and became in 1887 General Director and eventually owner of the distillery. As a long-lasting tribute to its visionary director, the distillery engraved each Tullamore bottle with his initials (DEW) and has become since then one of the most popular Irish blend whiskey brands. Recognised as a premium whiskey by the Whiskey institutions, Tullamore Dew surprises with its smoothness and refined flavours. A careful elaboration process together with a triple-distillation crafted the most original, subtle, generous whiskey with a lasting finale. In 1954, the distillery nevertheless closed down. The John Power & Son distillery purchases Tullamore Dew and merges it into the Irish Distillers group in 1966, born from Cork Distillers, John Power & Son and John Jameson & Son. The new directory closes down all operating distilleries and concentrates all the production in Midleton. A new distillery, the biggest of Ireland, is then built close to the old one. The production starts in 1975. After a 60 years break, Tullamore Dew resumes its production in the new distillery, entirely renovated. Since July 2010, Tullamore Dew has been purchased by the Joint-venture Lixir, created by the family-run Scottish business William Grant & Sons, also owners of the Glenfiddich and Balvenie distilleries, with the French Group Remy Cointreau. Tullamore Dew is today the second best-selling Irish Whisky in the world. Nose: maybe the boldest of the Tullamore Dew whiskeys. With a lively character, notes of caramel, caramelised sugar, cereals, citrus (lemon) and red berries, evolving on herbaceous fragrances of green and cedar wood. Palate: well balanced and elegant, following the nose first scents with woody, fruity and banana notes. Finish: short and lively, recalling malting barley and cereals. Bronze Medal, International Wine & Spirit Competition 2013. Tullamore Dew is the ideal base for Irish Coffee, which was the delight of Marylin Monroe, John Fitzgerald Kennedy, Eleanor Roosevelt, Humphrey Bogart and Ernest Hemingway.